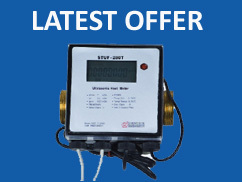 UDV-1000 instrument is a multifunctional intelligent flow meter. It can be mainly used to measure clean water flow velocity and muddy water flow velocity for hydraulic scientific research, hydraulic model testing and environmental monitoring. Click Here for details. This instrument is designed to measure flow velocity in an open-channel or a close pipe where the flow environment is harsh thus a robust probe must be used. By adapting cross-correlation and flow noise sensing technology, the CCPV-02 fully meets these strict requirements while providing stable results. The sensor is consisted of two pairs of stain-steel needles which are rigid and easy to maintain. The instrument coefficient doesn't depend on the environment conditions, such as temperature, sediments, etc. Those unique features make the CCPV-02 velocimeter very attractive comparing with other traditional velocimeters.